Luchino Visconti's The Leopard (Il Gattopardo), based on Giuseppe Tomasi di Lampedusa's best-selling novel, must surely rate as one of the most sumptuously beautiful epics ever made. The complete and uncut version of the film has been released in the UK on DVD by the BFI in collaboration with Twentieth Century Fox Home Entertainment, Inc. This release boasts a stunning high definition digital transfer from the film's original 70mm negative materials, with fully restored image and sound, overseen by director of photography Giuseppe Rotunno, and is presented in its original widescreen aspect ratio. 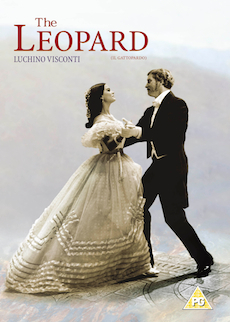 Set in 1860-62, during the turbulent period of Italian unification, The Leopard tells the story of an aristocratic Sicilian family threatened by the political upheavals. Burt Lancaster excels as the ageing Prince of Salina whose beloved nephew Tancredi (Alain Delon) goes off to fight with Garibaldi's revolutionary 'Thousand' and on his return falls in love with Angelica (Claudia Cardinale), the beautiful daughter of an up-and-coming merchant. This gorgeous evocation of an era, filmed on location in Sicily, is stunningly photographed, designed and costumed, with a rousing score by Nino Rota. It glitters with superb set pieces, culminating in the 45-minute ballroom scene where we can see and feel a society in transition. Feature commentary by David Forgacs, Professor of Italian and Head of the Department of Italian, University College London and Rossana Capitano, Visual Arts Department, Goldsmiths, University of London.